What makes Bowmore Distillery stand out from the crowd…..
1) In 1779 Bowmore became one of the first licensed distilleries. Many other places would also be distilling at this time, and Bowmore was distilling before this ~ but this is the ‘official’ date of origin. 2) Bowmore have their own floor maltings, producing 25% of their annual requirement. Simpsons in Berwick provide the remainder. They use Simpsons as they are guaranteed Scottish Barley and this is important to Bowmore. Each load of barley is traceable back to the field. When Bowmore require malt for distilling a batch of spirit, they use 2 tonnes of their own and 6 tonnes of Simpsons. 3)Depending on the weather the malting process can take from 5-7 days. They stop malting in the silent season as the temperature is too high (hopefully….!) and also, this is when there is least access to water. 4) Before malting the barley has a moisture content of 11%. The barley is soaked for 26 intermittent hours. It is soaked for 10 hours, rested for 10 hours, soaked for another 10, rested for 10, soaked for 6 hours, then rested for 4 hours. By now the moisture content has risen to 44%. 5) The barley is spread out on the malt floors with rows of wee furrows along it. This looks very ‘zen’ and it is! 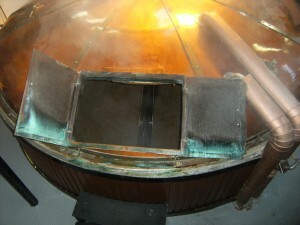 This allows the air to move freely through the barley and stop it over heating. The barley stays on the floor until it has germinated. Then it is dried to stop the germination continuing. The barley is spread out on the perforated floors of the kilns. 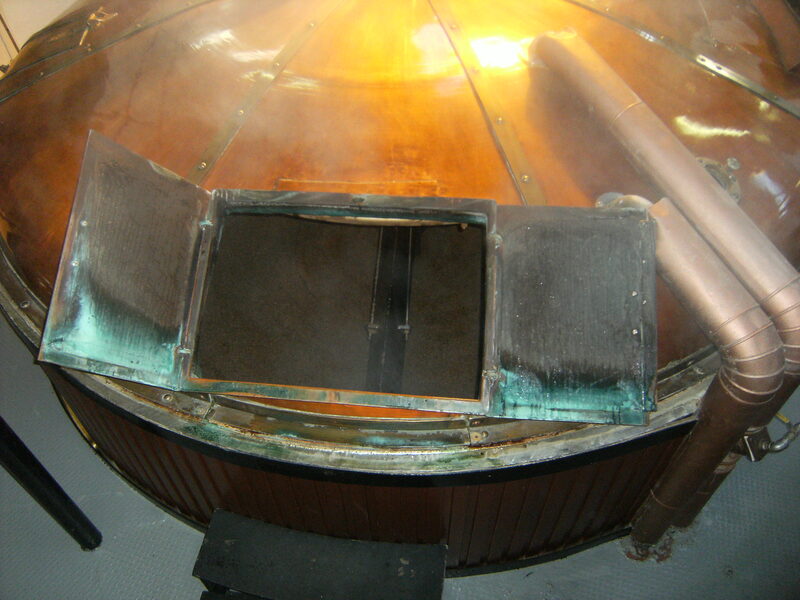 Fans in the pagoda tops above create vortices and pull the smoke up from the kilns below through the spread barley. 6) Bowmore smoke their barley for around fifteen hours and aim for about 25-30 ppm phenols. This translates to between 8-10 ppm phenol in their NMS ~ new make spirit. Then, they air dry the barley for another 45 hours. This hot air is created by hot water coming from the still room. Cold air from outside, runs past the hot water in a heat exchanger, it becomes hot air, which is then blown up through the kilns to dry the barley. 7) The ‘coombs’ are the dried rootlets which fall off the barely kernels as they dry, and drop to the floor of the kiln. These are swept up and given to the crofters and farmers to feed their hens. 8) Bowmore have two ‘coppers’ in their still house. These are big beautiful unusual copper kettles which are used to store and heat the hot water required for mashing. They are around one hundred years old. You can see the rivets from that time holding them together. 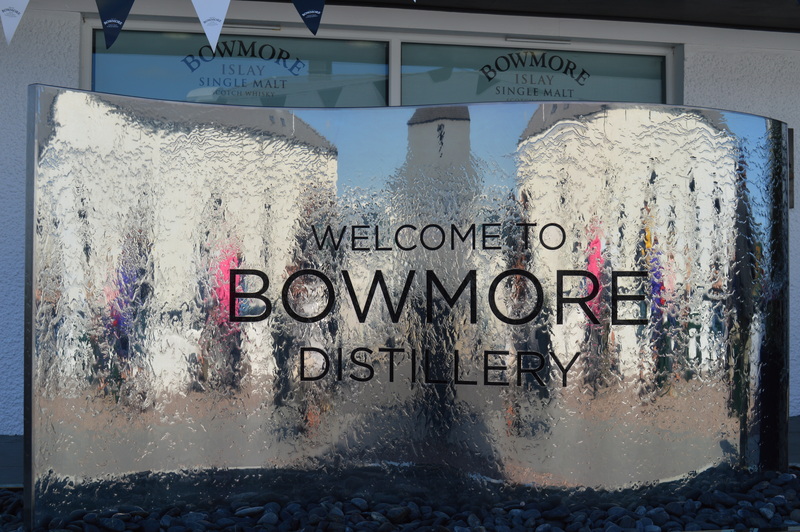 9) Bowmore use eight tonnes of malt in one Mash. Their mash takes roughly six and a half hours. 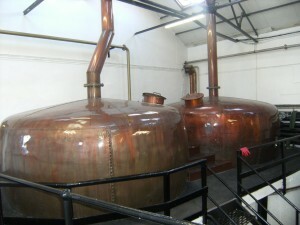 They have two ‘waters’, and a ‘sparge’ water – which is used as the first water of the next mash. They have a Half Lauter gear in their mash tun. This means that the gearing moves backwards and forwards, but does not move up and down. 10) One mash fills one washback. They get 40,000 litres of WORT from one mash. Bowmore have six Oregan Pine washbacks. As the washback is filling they tip in ‘putty’ consistency brewers yeast. By the time the washback is filled the yeast will have recreated itself fourfold. At the moment they use Mauri and Kerry yeast. Bowmore are doing a 48 hour fermentation. The wort goes into the washback at 18*C. and at the end of fermentation the temperature can naturally have increased to 28-30*C.
11) No.2 Washback has a Time Capsule underneath it, so it will be interesting to see this when the washback gets renewed. 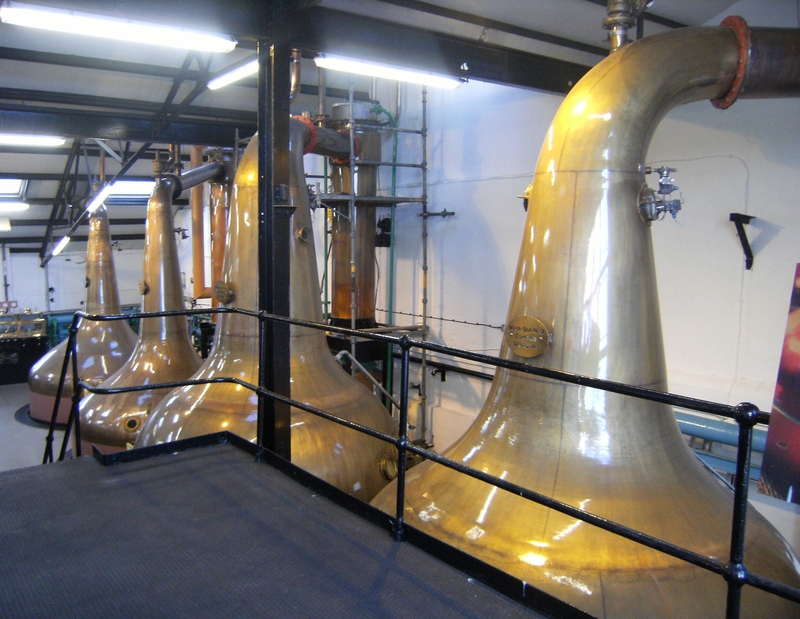 12) Bowmore have four stills. Two Wash stills and two Spirit stills. They have shell and tube condensers containing 120 copper pipes. 20, 000 litres of wash are put into both wash stills, and from this emerges around 16,000 litres of LOW WINES at around 22* abv. Each wash still can hold 30, 940 litres. So, the wash stills are only half filled. 13) The lyne arms on the spirit stills are not the same as each other. Still No.1 inclines slightly and Still No.2 has it’s condenser outside, so the lyne arm is much longer. Maybe this length acts like an inhibitor to the vapour similar to the inclination on Still No. 1. Each still is charged with around 12,000 litres of low wines, feints and foreshot. There is a lot of reflux in the Bowmore stills. This gives them a lighter, softer spirit as the vapours have recondensed and been reboiled before making it out over the lyne arm. 14) Their foreshots run is 35 minutes. They take their Middle Cut/Spirit Run/Heart between 74-61% abv. The spirit run takes about 3 hours. 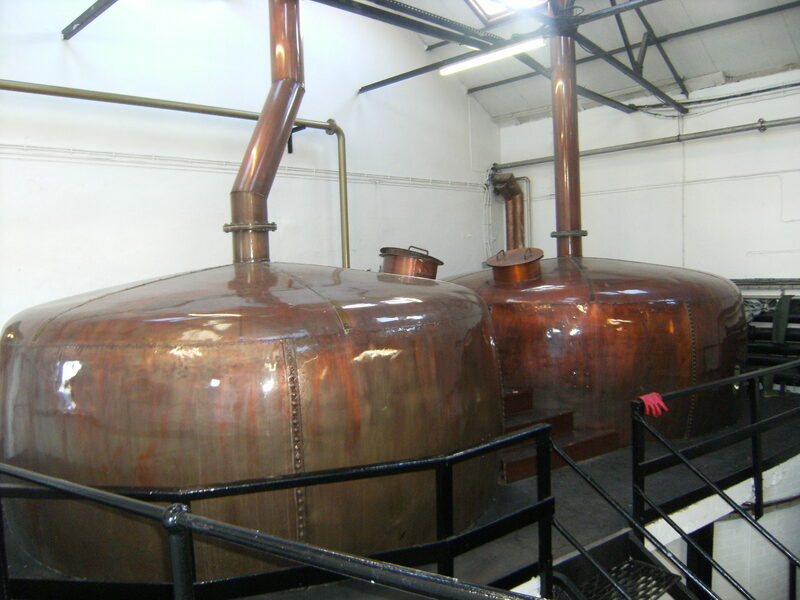 Each single distillation batch affords them around 4,800 litres of spirit, at an average of 70% abv. 15)In 2016 they intend to produce 1.7 million litres of spirit. And they are working roughly six days in the week. 16) Bowmore hold around 23,000 casks on the island with the remainder of their stock being stored on the mainland. Bowmore place a large significance on Maturation. They tell us that they spend four times the industry average on wood. Eddie MacAffer says that away back Bowmore replaced many of the old casks in their warehouses with really good quality wood. This decision has paid off as Bowmore now have well housed, good old stock sitting in their warehouses. An interesting point is that Bowmore are intending to buck the NAS ~ non age statement ~ trend of the moment, and revert to releasing smaller amounts of AGED whisky bottlings. This seems to me that Suntory are treating Bowmore like a ‘champagne house’, similar to the way Remy regard Bruichladdich. I think this is very forward thinking and will pay dividends in the future. 17) Sometimes, people think that when spirit is filled into casks and rolled into the warehouse, it is left to slumber untouched for years, until someone comes along and ‘discovers’ a cask hiding in a corner. This is emphatically not the case. Warehouses are worked! ~ and systematically at that. Rachel Barrie, Master Blender with Bowmore knows every cask sitting in a Bowmore warehouse. She knows how it is maturing, what it tastes like, whither it fits the ‘House Style’ at Bowmore. Nowadays, casks are all bar coded . With 23,000 casks to look after in Islay alone, a computer memory is essential. Rachel will send through requests every week asking the boys in the warehouses to take samples from casks and deliver them to her lab in Springbank, Glasgow. She will ‘ear mark’ casks that she particularly likes. She will then arrange a programme of checking on this cask ~ maybe every 6 months, maybe every 2 years. Good casks don’t arise by happy accidents, no matter what a marketing department tell us! ~ good whisky comes from casks that have been monitored, watched, tasted and discussed all their lives. Good whisky comes from places that know their warehouses. 18) Warehousing and blending are two sides of the same coin. The blenders and the marketing departments watch the trends and the fashions in the world. They think about how the casks they have sit within these parameters. Creating a new whisky is a very prosaic experience. It is systematically watching your stock and the stock market! and working everything out economically. But….. it is also, more than that. Yes, the parameters are laid out by cost, but instinct, wisdom, feeling and the human nose are the true players. Sometimes, a cask will stand out from the others. There is no rhyme nor reason for this ~ it is the same spirit, filled into casks from the same batch…. but, some magic has happened and something greater than the sum of its parts is born. 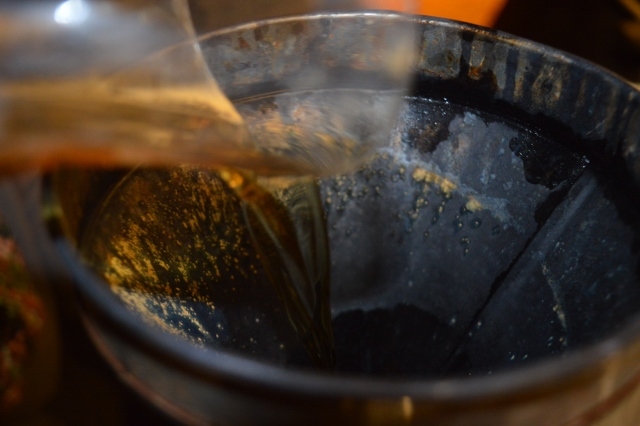 And, this, is the magic which makes us whisky drinkers!